The assorted nerdiness of a woman, not limited to but including tabletop games, Cosplay, amongst other topics. Hail and well met, pixies and sprites, to 2019: I apologize profusely for my laziness on Pitfalls and Pixies, but hopefully with the New Year I’ll be more active (and now that the holiday season is over, as well). This month’s RPG Blog Carnival kicks off with kjdavis’ ‘Divine Worldbuilding’. While not something I initially put great thought into, I suppose I would come now speaking about my current campaign and some of the deities which populate the realm known as Faustus Kil. In this magitech setting which I run, there are several countries and powerhouses in existance: Chervaux, Saum, Zoraiv, Criyith, Petra, Aggithil and the Dreadfang Republic. Not all of them have a binding mythology to them, which makes the countries of Zoraiv and Criyith radically different from the other established locations. Literally that cliche’d region on any map that reads Here Be Dragons, the country known as Criyith is exactly that: the homeland of the dragons on the whole, as well as their offspring the Dragonborn and Dracovecta (humanoids which combine dragon blood and lineages not of that species). Criyith is an island in the southwest whose inhabitants are odd: not only do they have scales, tales and teeth, but they have an innate fear of any magic not of a divine nature. As such, they have developed a close, intimate relationship with the four cornerstones of their regional pantheon. Those beings are the following, listed below and with their roles in their society. Glamdraug: The Divine Egg-Bearer. She Who Provides. Life Domain. 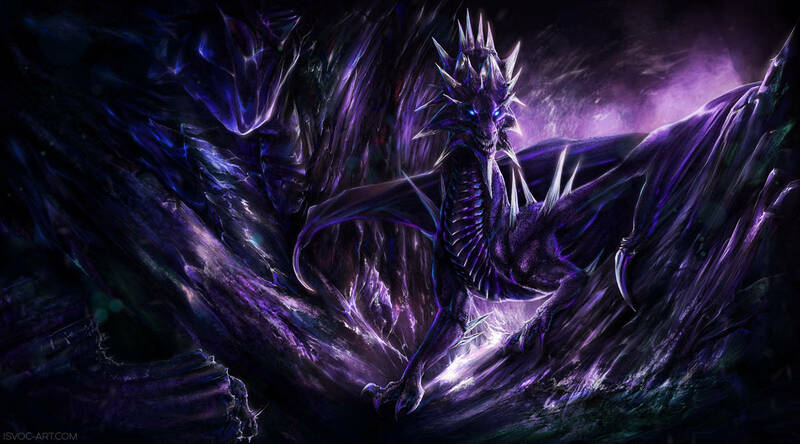 Glint from the Guild Wars franchise was a large preliminary inspiration behind Glamdraug. Not so much in appearance, but rather in what she represents. The first of the major Criyithian pantheon, Glamdraug is the matron of the society and by far the one who is held aloft the most (though her importance is neck-and-neck with the other three: it seems she is just more revered then the others). Life in its current state. The action of childbirthing, courting, etc. In this aspect, Glamdraug could also be associated with romance and couples, if one stretches this meaning. The extermination of the undead: a scourge against everything that this goddess stands for. 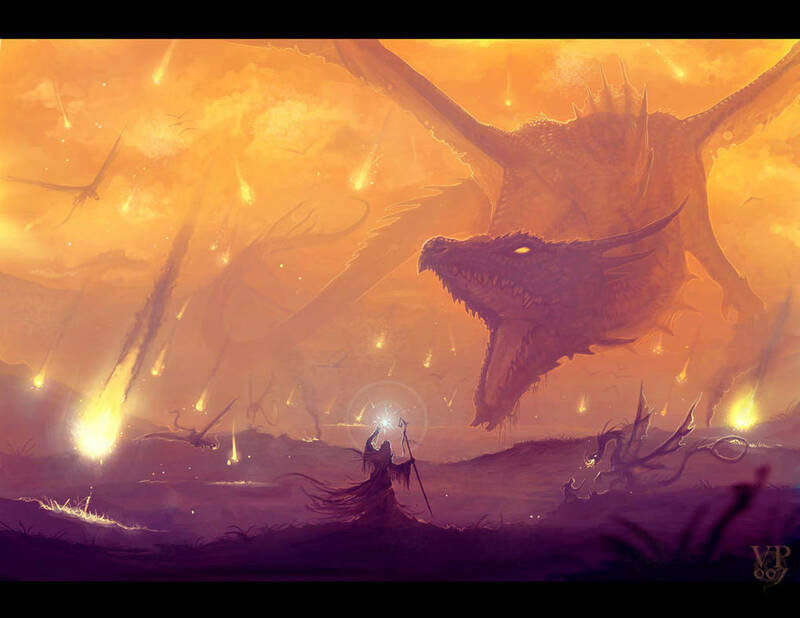 All of the dragons were created at the same time, by an unknown entity whose name is lost to all of those not their children. They are the only ones who remember this individual’s name, but they are sworn by blood and word to never reveal whom this may be. Glamdraug was the first created, and scholars speculate the favored child out of the four. 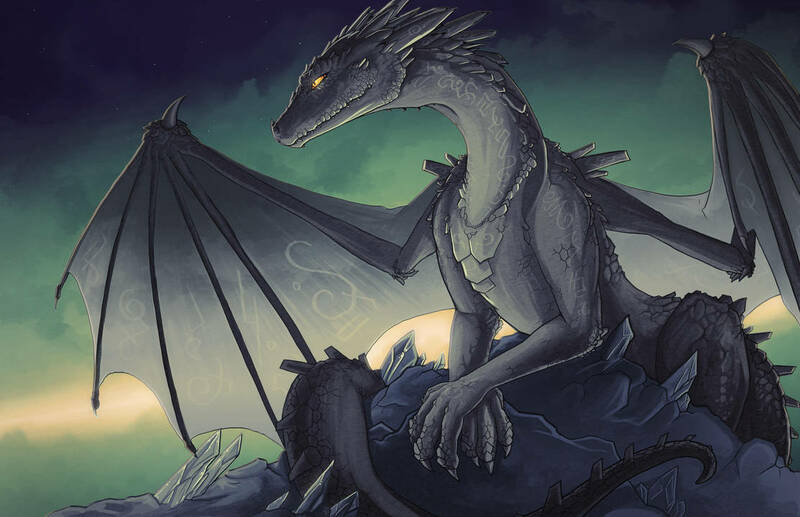 With a calm serenity to her, it is no surprise that she is favored among dragon-kind and revered as the Mother to All. Even those reptilian creatures who lack a semblance of sentience react at the mere mention of her name, such as wyverns and drakes. Khorvas: The Justicar. He Who Decides. Knowledge Domain. Perhaps the most studious of the four, Khorvas is the one who is most likely to speak to the mortal races beneath his wings. An adept scholar and collector of lost lore, the Justicar uses his acute mentality to win battles of wits and soothe over the arguments of divines and the common folk below. Decision making, similar to that of Anubis and the Weighing of the Heart in standard Egyptian mythos. Divine judgement, and delivering the will of the gods. A quirk about Khorvas is his precidings over the arts of divination, which is typically seen as something heretical. This is not the case in the Land Of Dragons, due to He Who Decides having a claw directly involved in this. Priestly workings dedicated to Khorvas often use this sort of magic in communicating deeper with him. In one of two current parties I run in this world, a player’s Dracovecta character says that she would identify most with Khorvas, as a Bard (College of Lore). Rilith is the scholarly sort, a third year at a mage school, and says that her veneration for this god most likely lead her down the path to studying at the Avehi Arcana Magitorium. Otughu: The Thousand-Winged. He Who Billows. Tempest Domain. Otughu is the third of the pantheon of Criyith, and some say he is the much more reserved foil to Parnaghast. Storms are chaotic and uncontrollable, but have a pattern: war and the insanity which She Who Feeds presides over does not, coming about out of nowhere. Storms (it’s literally in his job description). Orderly chaos, or chaos that has a greater importance. The elements of air and water: sources that nourish and provide, which works in tandem with Glamdraug. Otughu is, by far, one of the more primal-minded deities due to the nature of what he presides over, but this does not mean savage. Otughu teaches those who wish to learn his viewpoints of Faustus Kil that being in tune with one’s instincts does not necessarily mean something negative in connotation. One of his prime teachings is “be the storm’s fury, but also the calm to its eye”. Because of his controlled ferocity, he is not directly associated with the bloodlust that comes about in combat. Moreso, he is the tactician that strikes hard and at once after methodical thinking and deliberation. He is not about attacking at random, but knowing the precise moment to come in and call attention to him. Parnaghast: The Ever-Active. She Who Feeds. War Domain. 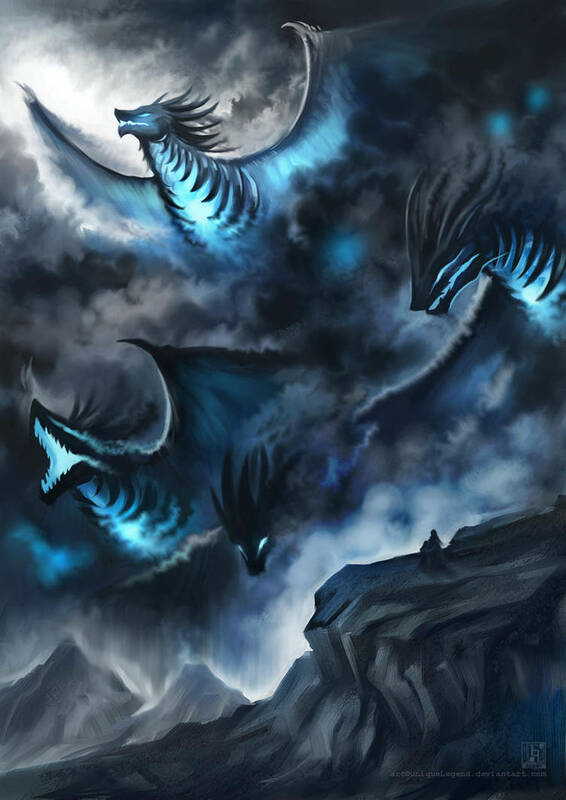 Parnaghast, strangely enough, is the fourth of the dragons and is actually the most fleshed out (relatively speaking). The Criyinthian deity of war, destruction and the end of all things, she is a necessary evil when in conjuncture with the other three. Not merely the in-world chapter of Wizards of the Coast’ main baddie Tiamat, she has her own role to play in the world at large. Generalized chaos, be this good or ill.
Destruction (for both personal pleasure and to ensure the start of a new day). Conquest over enemies, the patron of the warrior, per say. That does not mean that she is merely the villain in this mythology. Parnaghast’s fury is oftentimes what is needed to bring calm to a calamity: the end of things to allow for the new to blossom. From the ashes of her rampage comes the start of the beginning. Chaos also does not directly associate itself with things such as trickery, as often many real-world gods and beings who are associated with Trickster archetype are also involved in chaotic aspects. This is not the case with Parnaghast, who has a distinct lack of this sort of nature to herself. She is the blood-rage of barbarians; the pain in a mother’s cry as she gives birth; the will to survive when one must decide on flight or fight.